Join the discussion on our forums! Come discuss Treespeaker over in our dedicated Treespeaker discussion topic. I really think Treant druid could of been something good had this card read. 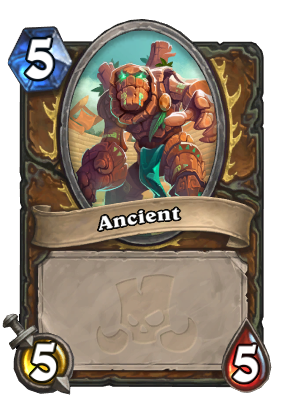 Destroy all Treants you control summon a 5/5 Ancient for each Treant destoryed this way. So... the text says "transform"... have you tested the card? Does it really destroy or transform like hex or polymorph? Yeah tested it, it transforms the Treats like Hex so they don't count as dying opposed to a spell like Poison Seeds which does kill all the targets and replace them with Treants. So as mentioned any Treants transforming like this doesn't count towards Mulchmunchers Discount. easy way to think about it, if you adapted the Treants and gave them the death rattle summon the 2 1/1's this card would not trigger that and you would lose the death rattle when they turned into ancients. Great choice in Token Druid! 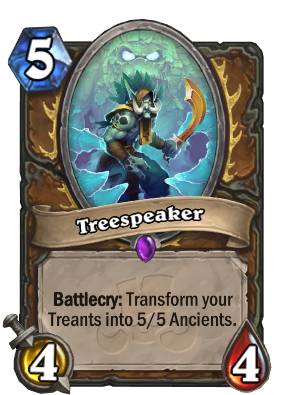 Definitely going to be trying Treant Token Druid. Soul of the Forest says hi. Probably a first day include in Token Druids. useless in token druid, the point of the deck is to kill with booster by having a full board. But in a treant deck this is very good. Why would you need a golden sword just to cut some wood ? Fungalmancer is not a valid comparison because it doesn't prevent your minions from attacking. Don't really see why they printed this wehn they could haave printed more Attack Druid cards. A thought just occurred to me regarding this card's Wild potential. Considering how Poison Seeds has found its way back into the Wild meta, Treespeaker could become a crucial tech card against the Druid mirror matchup. Suddenly, the Poison Seeds Spreading Plague dream combo doesn't seem so foolproof anymore; if your Druid opponent doesn't clear away your side of the board's Treants in time (aka on the same turn that he/she created them), you might just have a Treespeaker up your sleeve to take advantage of the window of opportunity. Alternatively, with regards to the non-Druid matchups in Wild, maybe Treespeaker plus (your own) Poison Seeds could still be marginally useful (especially if you're pitted against opponents who rely on pivotal "mass flood" swing turns, e.g. Big Priest's Lesser Diamond Spellstone and every Reno deck's N'Zoth, the Corruptor). 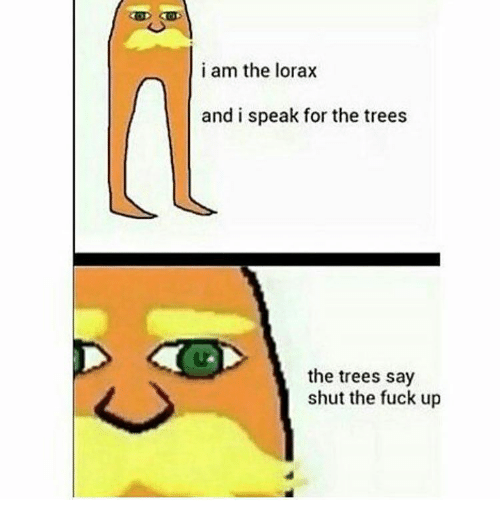 Should've just named him Lorax. Setting aside my typical nonsense in the comments for a moment, I’d like to express my disappointment in the Rumble’s Raptors. I'm almost never a serious person in the comments section, but for this post I am. Blizzard, you have one more unrevealed card for Druid. One more chance to give Gonk support. Please help a Raptor Bro out. Hours, though? Besides, I feel you have a certain bias towards avian-like bipedal prehistoric pack predators. Just a hunch. Yes hours. It took a longass time to get it the way I wanted it. It’s not like I’m a professional artist or anything. And yes I have HUGE dinosaur bias. That’s why I was somewhat salty when the concept didn’t end up as cool as I hoped. I’ve genuinely never ranted before, but I’ll get over it. The rest of the expansion looks pretty fun. I went back to look at it I assumed it was a photoshop like your pfp and that one Time Out! edit but it's a full on awesome drawing. My bad. If it makes you feel any better, it's likely they'll keep going in this direction with druid in future expansions and make some of these worthless looking cards viable with new additions to the archetype. I hate druid not as much as combo shaman , but you are right just remeber that when the new expansion comes out druid will have to get some love. Y’all are probably right. People barely used Hadronox before Witching Hour [deck]Witching Hour[/deck] was a thing 2 sets later. And glad you like the art bro!